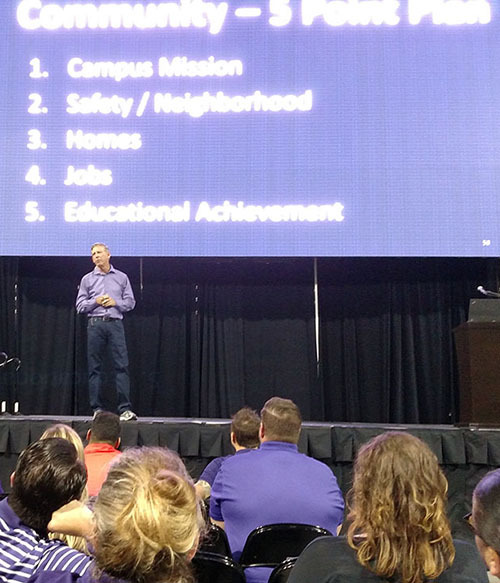 GCU President Brian Mueller speaks to the all-employee meeting Friday. 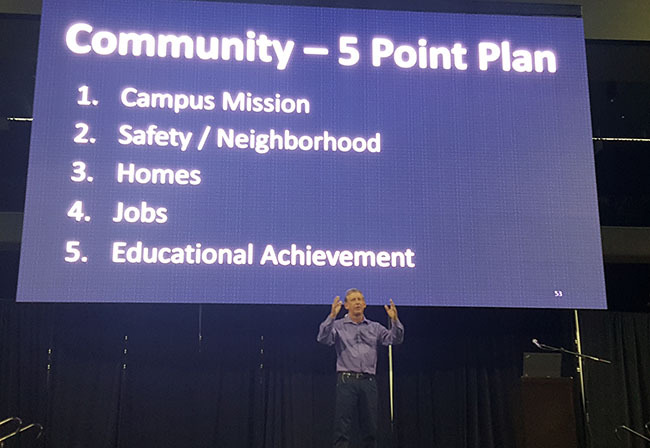 The spirit of Grand Canyon University was in full display Friday in an energetic all-employee meeting that hit the high points of what GCU has accomplished and what is to come. It was hard to tell which of the two is more eye-popping. President Brian Mueller spoke at length about the checked boxes on the ledger, including GCU’s investment of more than $600 million into its infrastructure, the 30 percent rise in home values and declining crime rates in its neighborhood, and its devotion to new initiatives such as the Habitat for Humanity partnership and the Students Inspiring Students scholarships for inner-city students. The path ahead is equally important. Mueller spoke passionately about the importance of the University being the catalyst for revitalizing west Phoenix and turning it back into a middle-class neighborhood. “I’m not excited about anything more than this: When we decided that we were going to have the money to put a billion dollars into this campus in a 10-year time frame – and we’re more than halfway through that – the question was, ‘Are you going to do it at 33rd Avenue and Camelback?’” Mueller said. “What happens is that one business moves out and the tax base erodes. Another business moves out and the tax base erodes. Another business moves out and the tax base erodes, and pretty soon no one wants to live there and there isn’t money for public schools, and there isn’t money for pools and golf courses. “The gangs move in because they sense weakness, and the gangs bring prostitution and they bring drugs and they bring other criminal activity, and then you’ve got an inner city. It keeps spiraling downward and downward and downward and cities don’t know what to do, they keep cutting back on services, and it just keeps getting worse. The answer, clearly, is a resounding yes, and a key part of that is providing more jobs for people in the neighborhood. Mueller emphasized the importance of hiring people who live nearby, people whose children yearn for the chance to attend college. The University’s offer of free tuition to the children of employees makes this another way of breaking the cycle of inner-city poverty. Revenue for the second quarter of 2016 was up 9.5% from the previous year. The number of students reached 67,424, a jump of 7.1% year to year. The percentage of “bad debt” taken on by the University has plummeted from 15.2% in 2010 to 1.8% this year. The University has saved 35,378 employee hours by converting to electronic documents. The number of students receiving welcome calls, which was at 68.16% six years ago, is at 99.72%. The cohort default rate continues to drop and is at 9%. Dr. Hank Radda, the University provost, stressed the importance of making all this work to the benefit of students — and helping those students thrive not only academically but also spiritually. GCU’s ambition also extends to its athletics program. 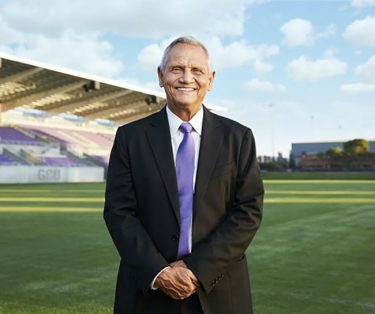 Jamie Boggs, the deputy director of athletics, reported that the University recently learned that it has been advanced by the NCAA to the fourth and final year in the transition to Division I.
Men’s soccer coach Schellas Hyndman can’t wait for the first game in GCU Stadium. “There’s no question that because of the collaboration and hard work of this University, we’ve set the standard for Division I transitioning institutions, and we’re really proud of that,” Boggs said. The start of the soccer season and the opening of GCU Stadium on Aug. 26 is a major focus for athletics as well, and men’s soccer coach Schellas Hyndman praised the vision of Mueller and Mike Vaught, vice president for athletics, in getting the new facility built. “There’s no better soccer stadium anywhere on the planet,” Hyndman said. And, of course, there also is no lack of enthusiasm for basketball. The GCU men gained national recognition for winning 27 games last season, and the Havocs student cheering section was part of the conversation, too. Coach Dan Majerle noted the attention the Lopes got in the national media and said opposing coaches tell him all the time how concerned they are about playing at GCU Arena. 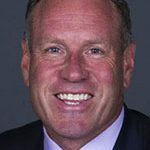 “My goal and our goal as a coaching staff and as a team is to win a national championship,” Majerle said. “People say I’m crazy. But I think they said President Mueller might have been crazy when he set the vision for this place. I don’t think I’m crazy. I think we’re going to do it. That kept with the we-can-do-this theme of the day. Mueller takes great joy in talking about what west Phoenix was and what it can become. 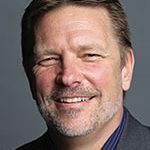 “Companies are going to look at this thing and say, ‘If we’re graduating three or four thousand people on an annual basis as engineers, computer scientists, information technologists, biologists, maybe someday chemists, people are going to be interested in that future workforce and then will become interested in west Phoenix,” he said.